As I had hoped yesterday, the sun came out in all it's glory and gave us an absolutely gorgeous day. I'm watching it rise again right now as I type this and am so glad we won't have any rain for at least a few more days - the weatherman even predicted a 70 degree day for Friday! Hmmm, what excuse can I come up with to be outside on Friday? I know, if I'm outside, I won't be stamping, but if I get busy and make a card as simple as this one today, I can have the best of both worlds! How's that for a segue?! The card I'm sharing with you today is not green, but for you stampers that are celebrating St. Patrick's Day - "Erin Go Bragh!" I'm not sure what that means, but I just wanted you to know that I'm thinking of you so please don't pinch me, ok?! This card is one that we made in Just Cards classes yesterday - aren't you sad you missed them? You'll just have to come next month, ok? 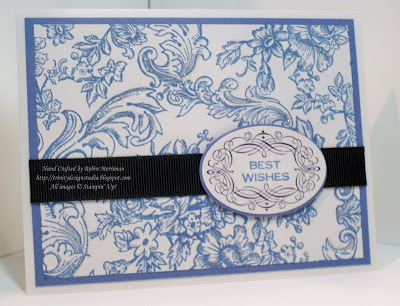 This beauty uses the Bella Toile Background stamp, inked in Brocade Blue and stamped on Whisper White Cardstock. I then used my 2-Way Glue Pen to highlight some of the thicker areas of the image and added Dazzling Diamonds to make it pop! This was then layered on to a piece of Brocade Blue cardstock and a piece of Basic Black 5/8" Grosgrain ribbon was wrapped around the front and secured behind the panels. Next I adhered them to a folded Whisper White cardstock base then I moved on to the greeting. I am LOVING the Vintage Labels stamp set - which is a FREEBIE during Sale-A-Bration through the end of March - and I used it again here. The label was stamped in Basic Black ink on a Whisper White scrap and then I added the greeting using Brocade Blue ink. This was so easy to do using the New Clear-Mount stamps! I love being able to see where I'm stamping! Once I'd stamped this, I punched it out with the Wide Oval Punch. To create the Brocade Blue cardstock border, I just used my Ovals Die and my Big Shot to cut the layer. These two were adhered together and mounted to the card front with Stampin' Dimensionals. Now, could a card be any easier than that? This is definitely a less than 10 minute card! When you need something lovely in a hurry, think about your background stamps and just pair them with a bold color mixed with white - your card will be finished in no time and will be gorgeous to boot! Blogger's Challenge - Another Sketch! Blogger's Challenge - Think Spring! March Just Cards - Space Available! UDI Inspiration Challenge - Ice Cream Memories!